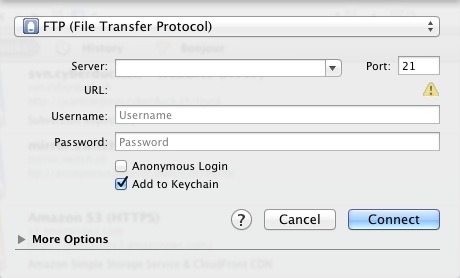 Among the various free FTP programs available to download on the internet for Mac OS X, we recommend CyberDuck. It can be downloaded free of charge from http://cyberduck.ch. The program is installed by dragging the CyberDuck icon into your computer's Applications folder. Select the 'Open Connection' icon. You will see a window appear that asks for your login information. 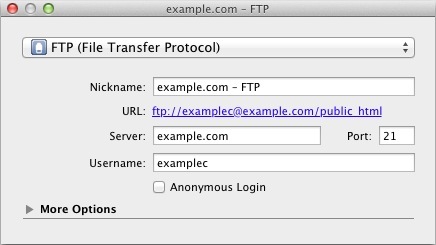 For the protocol, make sure that FTP is selected. For the server, if your nameservers are pointed to ns1.FastDomain.com and ns2.FastDomain.com, you may simply put your domain name. If your nameservers are not pointed to us, then please use the IP address that you received in your introductory E-mail message. Your username can be found by visiting the FTP Accounts section of the cpanel. Please note that your username may contain "@domain.com" where domain.com is your domain name. Now, you can see the files and folders on your server. Click on the bookmarks icon. At the bottom of the CyberDuck window, click the New Bookmark button. A new window will appear with the bookmark details. Close the window to save the bookmark. Click the Bookmark button again to return to the main screen. 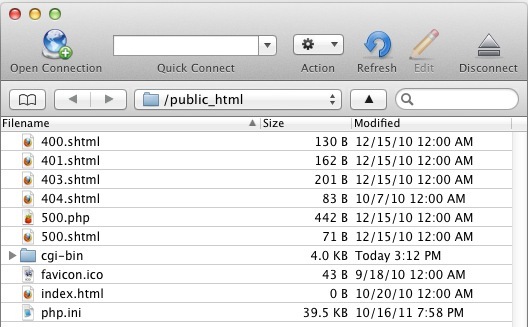 The easiest way to copy files to and from the server is to simply drag-and-drop them using Finder. 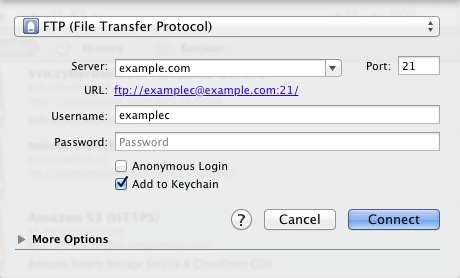 I want to be able to provide an FTP link to my site that does not use Unlimited FTP or Anonymous FTP. How to install a program using MOJO Marketplace. Why does my FTP connection slow down?